Ocean waves are caused by wind blowing over the waters surface. They can travel thousands of miles and range in size from tiny wavelets to over 100 feet tall. Waves caused directly by the local wind are called wind waves. Wind waves are short, choppy, and tend to break (white cap) when winds reach approximately 17 miles per hour. Waves that travel outside of the area they were created, and are no longer the result of the local wind, are called ‘swell’. Compared to wind waves, swell are longer waves with smoother crests. Waves have two main parts. The wave crest is the top part of the wave and what people commonly refer to as a wave. The second half of the wave is the trough, the low point that comes in between two wave crests. 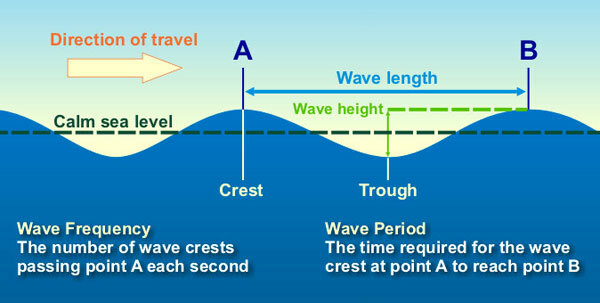 Wave period is the length of time in seconds between wave crests.